Tom Doughty and Graham Bellinger - grahambellinger's JimdoPage! 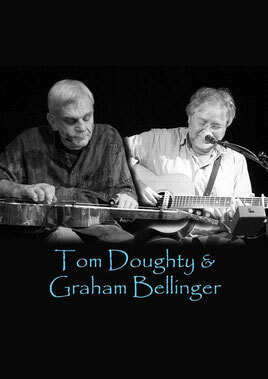 In 2013 I started playing some duo dates with Tom Doughty - singer, songwriter and master of lap slide guitar. These gigs give me a chance to play with a true musical master and to attempt to play guitar, mandolin, cello mandolin and harmonica whilst trying to improvise, read Tom's mind and predict his next move! Most of all I try not to get in the way of Tom's superb playing. Our duo dates are on my live dates page. The duo of Northwich-based slide maestro Tom Doughty, and the almost-resident at the venue, Graham Bellinger – who has been a mainstay on the Chester folk scene for a long, long time and also is a member of such bands as Root Chords and The Deportees – played a sparkling gig at Alexander’s in Chester, delivering a mix of blues/folk and World music and beyond. Tom Doughty is without doubt one of the finest acoustic/slide players in the country and has graced festival and club stages for a good many years now, his lap style playing is quite stunning, with beautiful tone to match. Highlights of a most enjoyable evening were a cracking version of Bob Dylan’s “Girl From The North Country; the powerful and hard-hitting Tom Doughty composition “Zimbabwe” and also “Life Is Just A Journey” brought the audience to their feet. Together, the two musicians combined their talents and different types of music to often improvise and veer slightly away from the norm.